Looking for a strong quality camera for hunting is a tough job. You need to look carefully into the quality of the cameras before making a purchase, and you have to ensure that it meets your needs. With so many cameras to choose from, it can be a daunting task to find what you are looking for. It would even be harder if you were a newbie at hunting. This product review will list down and review the many features of the KV.D Game Trail Hunting Camera, as well as the pros and cons according to the users that have already tested this camera, and the benefits you will get if you purchase it. The KV.D Game Trail Hunting Camera is packed with so many features for hunting enthusiasts out there. This camera has a Programmable Megapixel high-quality resolution to help you capture great images for your hunting sessions. It also has a 1080P@30FPS FHD video with sound, Black IR, a powerful 0.5-seconds trigger time, loop recording, and 2.4″ TFT built-in color viewer. The KV.D hunting camera is water resistant and waterproof up to IP54. It allows you to play back photos and videos for missed footages. It has 42 IR LEDs and Set 20 IR LEDs available in power saving mode. This camera can support up to 64 GB of an SD card, which you can buy separately. It features PIR Sleep, Interval, and Timer. There are temperature and moon phase stamp on the images for more details, and a device number setting that enables you to code locations in the photos. It has an auto play mode in the “Slide Show” and it also allows you to lock important image to avoid them from being deleted. The camera monitor shows a nine-rectangle-grid mode so you can view images better. Lastly, it takes color pictures during the day and monochrome pictures at night. Upon purchase of the KV.D Game Trail Hunting Camera, you will automatically receive one trail camera, a user manual, one USB cable, one TV cable, and one strap. Hunters will love the high-resolution quality of this camera’s images. It has 16 Megapixel (Interpolation) high-quality full-color resolution and 1920x1080P HD Video with Audio Record. Its long night vision range has a low-glow black infrared with 42pcs 940nm Black IR LED, which allows the camera to take full-color photos or videos during the day and black and white color photos or videos at night. It has a super fast trigger speed with an impressive 0.5-second trigger speed when using a 2GB SD card). This is a great advantage for users that target fast-moving subjects. The KV.D features a patented motion freeze that is ideal for the surveillance of reptiles, and cold-blooded animals or amphibians. This KV.D trail camera supports an SD or SDHC memory card that has up to 64GB of memory. It can extend its battery life up to 6 months long with sufficient 8 AA batteries. According to some users that have previously tested the KV.D Game Trail Hunting Camera, 16mp high-resolution gives bright and beautiful pictures that assist the users with identifying markings on their targets, which is necessary for game management. The 0.5-seconds trigger time allows them to catch prey quickly. Some users can attest that the KV.D camera takes great pictures compared with other hunting cameras. It is also relatively easy to use. You can use the default settings, or you can set it up the way you prefer. The excellent quality photos, fully weatherproof case and good battery life are highly advantageous for many users out there. Contacting the sellers is easy. They are willing to assist you or replace your item when you encounter problems or issues with the KV.D trail camera. SUPER FAST TRIGGER SPEED:With an impressive 0.5 second(when using 2GB SD card) trigger speed. 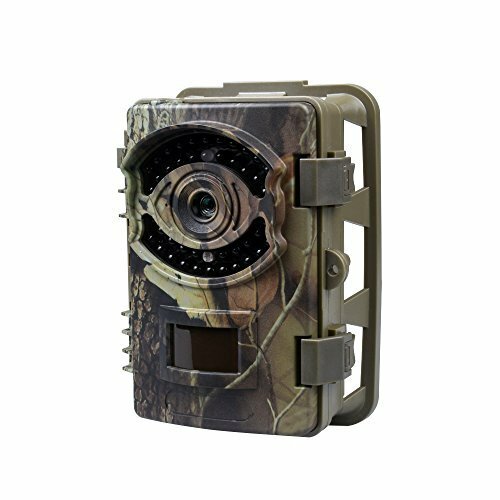 Previous users speak highly of this Game Trail Hunting Camera from KV.D, which is why it is no surprise that they would recommend the gadget to anyone who is interested in capturing photos of wildlife in their garden. Their money would be well spent on the number of features that would help them highlight their hunting activity and make the job faster and more convenient. Previous users recommend this camera to first-time buyers who want to learn and to professionals who want to take their shooting skills a notch higher.